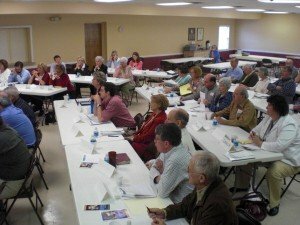 I attended a conference nearly 10 years ago by Mark Miller that gave away these secrets to Effective Evangelism Training. Challenge the conventional wisdom — Evangelism is a process not an event (see: Evangelism: Process or Event? ), so one size doesn’t fit every context. Make Evangelism Personal — Who do you know that does not know Jesus Christ? They are people with names, stories, and hopes, and fears. Pray, Engage. Focus on Fundamentals — How to Build Relationships, How to Present the Gospel, and How to Invite People to Faith. Create Multiple Training Opportunities — People will never learn from training they do not attend. A church could offer day long workshops, 4-6 week courses, self study, weekend retreats. One time is not sufficient. Offer multiple training events during the year. Pray — Don’t Forget that any evangelism work is preceded by prayer. Encourage workshop participants to pray for people they know. Take the time to do it. Model it — Make evangelism your own priority and follow your own steps. I found in my own story that all of these are vitally important. Process. Seeing evangelism as a process rather than an event shifted my thinking towards seeing the sovereignty of God in bringing people to faith. Practice, Practice, and Practice. After every encounter, I examine the conversation to see what I can learn from, what would I do differently, and how can I pray for that person. Practice doesn’t make perfect, but it does increase confidence in sharing my faith. Model. I found that when I was preaching weekly, nearly every week I would have a fresh encounter story to share with the congregation about a conversation that I had with a person. I modeled evangelism conversations in my sermons, and one could tell it was such a part of my life. The congregation grew in its own confidence and ability to do personal evangelism. The principle that I share in my training seminars are now on CD I’ve put together a 5 CD of my day long seminar that can help you grow a little more comfortable in sharing your faith. Click on the banner to see how to get my personal evangelism training delivered to your door. I AM LIGHT-CHEERFUL BRIGGS LIVING NIGERIA, RIVERS STATE, IN PORT-HARCOURT CITY. I AM SEEKING TO HAVE AN INCREASED KNOWLEDGE IN EVANGELISM, AND WISH TO UNDERGO A SERIOUS EANGELISM TRAINING. CAN YOU PLEASE DISCIPLE/ TEACH ME ON EFFECTIVE EVANGELISM? I WANT MY FELLOW HUMANS TO BE SAVED LIKE ME. BECAUSE EVERY PERSON WHO DIES IN THEIR SINS HAS AN APPOINTMENT WITH THE JUDGE OF THE UNIVERSE, AND HELL OPENS WIDE ITS JAWS. I WISH TO BE WELL EQUIPPED IN WORKING WITH GOD FOR THE ETERNAL WELL-BEING OF DYING HUMANITY. YOURS BROTHER IN THE FAITH OF CHRIST. Thanks for visiting. I’ve got plenty of resources on this website to help you. I encourage you to sign up for our newsletter to help you find things on the website over the next several days. I’ll email you plenty of resources, focused on church hospitality and personal evangelism.